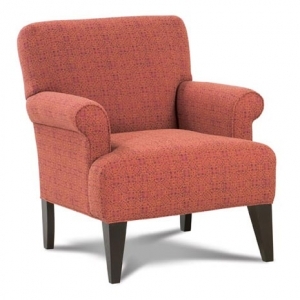 Relax in stylish comfort in our Harris chair. 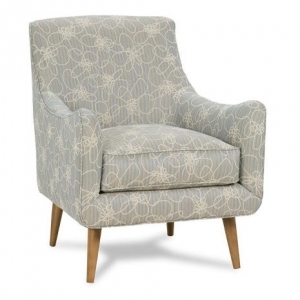 The exposed wood frame has a retro flair with the gently curved arms and pencil style legs. 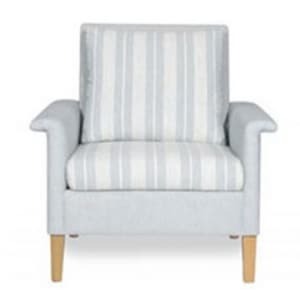 The cushions feature a small line of button tufting on the back - not too much, not too little. Customizable with your choice of wood finishes and fabrics. Proudly made in the USA! 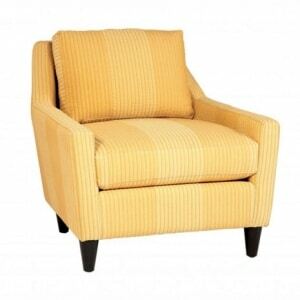 The popular Nancy chair offers a boxed style seat cushion, a T-style back cushion, rolled arms, and a removable slipcover. For added comfort, a matching ottoman is offered. 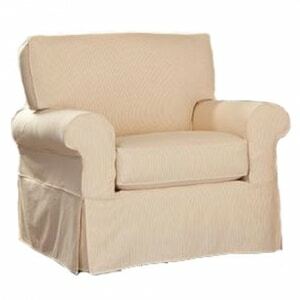 Many customizable options offered, including hundreds of fabrics, multiple cushion densities, and additional slipcovers. Proudly made in the USA! 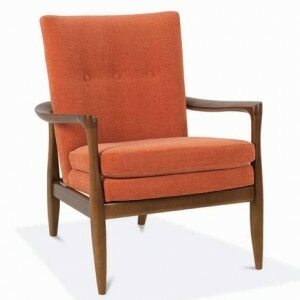 The Roxie chair features tall wooden legs, fitted seat and back cushion, inset rolled arms, and streamlined tailoring. For added comfort, a matching ottoman is available. 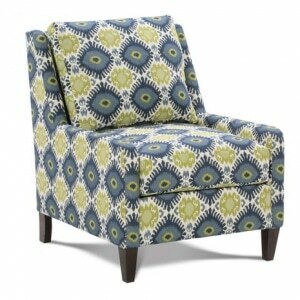 Many customizable options offered, including hundreds of fabrics and several wood finishes. Proudly made in the USA! The Tad chair blends minimalism with comfort: compact legs, extremely low arms, and loose seat and back cushions. For added comfort, a matching ottoman is available. 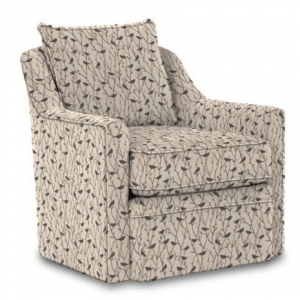 Many customizable options offered, including hundreds of fabrics, multiple cushion densities, and several wood finishes. Proudly made in the USA! With streamlined tailoring, welted trim, tall pencil legs, and narrow curving arms, the Norton chair is a modern twist on a style from decades past. 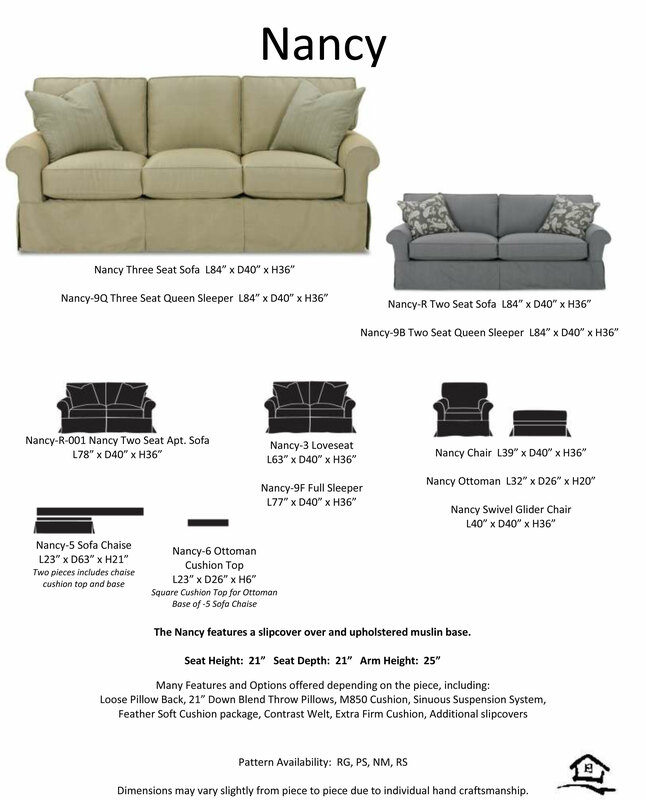 Many customizable options offered, including hundreds of fabrics, multiple cushion densities, contrasting welt trim, and several wood finishes. Proudly made in the USA! The Molly chair features tall exposed wood legs, a t-style seat cushion, and a fitted back with button tufting and a soft scoop at the top. The chair is offered in two back heights - one is 40" high and the other is 34"H. For added comfort, a matching ottoman is offered. Many customizable options: hundreds of fabrics, many wood leg finishes, contrasting button tufting, and multiple seat cushion densities. Proudly made in the USA! 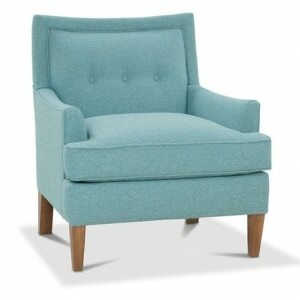 The May chair features chunky wooden feet, rounded arms, welted trim detail, and a plush back cushion. For added comfort, a matching ottoman is offered. 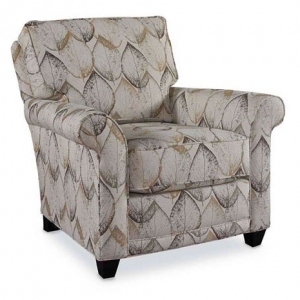 Many customizable options are available, including hundreds of fabrics, multiple cushion densities, contrasting welt trim, and several wood finishes. Proudly made in the USA! 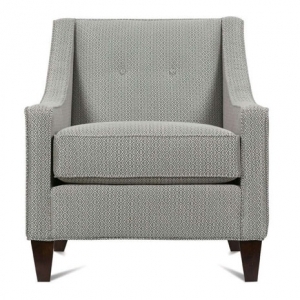 Featuring a button-tufted back cushion, sloping track arms, and tall wooden legs, the Kelly chair has style as well as function. For added comfort, a matching ottoman is offered. 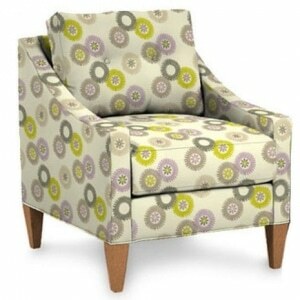 Many customizable options offered, including hundreds of fabrics, multiple cushion densities, and several wood finishes.